This is the second post in my Eating Down Under series. Other posts in this series include Din Tai Fung, Sydney. This is also the 22nd post in the 31 Days 31 Posts Challenge. I love seeking out unique aspects of a culture’s cuisine, even if it’s just a slight variation on what I eat in my own culture. It’s fascinating to see how geography, local ingredients, and neighboring cultures shape the cuisine of a location. Australia itself is interesting because most of the people there originally came from England, thus it’s natural that the cuisine will be strongly European. However, with time and distance, groups eventually develop their own little quirks and nuances. We only spent a few days in Sydney Australia. However, it was fun to try some food that was definitely unique to Australia. Here are the top three. A flat white is an espresso-based drink that involves two shots of espresso topped with a layer of microfoamed milk. Although similar to a cappuccino, the foam is flat and the bubbles are much finer and creamier. Furthermore, a flat white has less milk compared to a cappuccino, more like a cortado or a Gibraltar. In Sydney, every single coffee shop offer “flat white” as an option alongside cappuccinos, lattes, and espressos. Perhaps it was the novelty of it, or perhaps it’s just because they are really, really tasty, we always ordered “flat whites” when we went to a coffee shop, which was like, everyday. 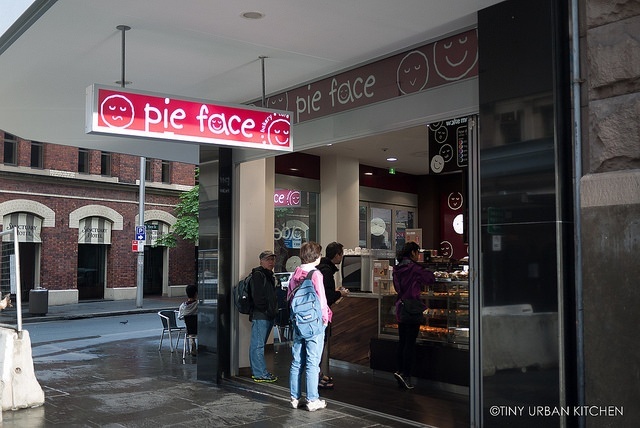 This Australian cafe serving cute pies of all different flavors (and facial expressions!) can be found all over Sydney. In fact, there are 70 locations throughout Australia. Each face stands for a different filling. They have many savory fillings as well as sweet ones. We ordered a few as a fun breakfast since we lived just around the corner from one of these cafes. They are pretty tasty, and definitely a convenient way to eat a meal on-the-go. We were surprised just a few days ago to see one in New York City. Apparently this is the first one they have opened in the U.S. and so far it seems to be doing really well! So now all I have to do is travel 4 hours via train to get my Pie Face fix. Harry’s Cafe de Wheels is a historic pie cart that has continuously operating for over 70 years. The founder, Harry Edwards, opened the cart first in the 1930’s to provide late night fast food options such as “pie & peas” and “crumbled sausage.” It closed during World War II (Harry fought in the war), but he reopened it in 1945. It has been open ever since, and has become an Australian icon as well as popular tourist attraction. The most popular and signature item is the Tiger, a beef pie topped with mushy peas, mash potatoes, and gravy. It’s satisfying, hearty, and very filling. Hot Dogs were added to the Harry’s menu in the 1970’s to serve hungry American sailors. The Hot Dog de Wheels consists of mushy peas, garlic, onion, chili con carne, cheese and chili sauce. Finally, if you’re just not a mushy peas person (and not everyone is! ), you can always get a simple meat pie (they have several kinds), which serves as a great little snack. Looking at all these Australia photos really makes me miss it. Sydney is such a beautiful city, with so much vibrant life, great food, and stuff to do. I’m having so much fun sifting through my photos from this trip. Can’t wait to continue sharing more and more of it with you! I’m about to move from Sydney to Boston (and consequently looking for good things to eat in Boston). I think i’m going to miss the great cafes and asian food in Sydney! Thanks for the post. I am heading over to Sydney soon and is staying for a month, will try these out for sure. I am little bit worried about Din Tai Fung Sydney after reading your post though….